- Elder, I am afraid of delusion. - So you should. Whoever is afraid of delusion will not be deluded, because they are careful and they deposit their every thought - they hide nothing and are thus helped. - Elder, what is a predisposition for delusion? - The predisposition for delusion is to imagine that you are something special and showing others that you are achieving something. It is to imagine that you have reached spiritual heights because - for example - you have accomplished an ascetic feat (when others have not yet perceived the meaning of the spiritual life) and then behave arrogantly. It is when you force yourself egotistically during ascesis in order to attain the measure of a Saint so that others might admire you: that is the beginning of delusion. Violence is one thing and force is another. I told someone once, "Take care that you don't become deluded, with those tactics of yours; it won't be to your benefit." "Me, deluded?" he replied. "I even abstain from meat." But he didn't go to confession either. He used to disclose his sins to an icon. "What are you? 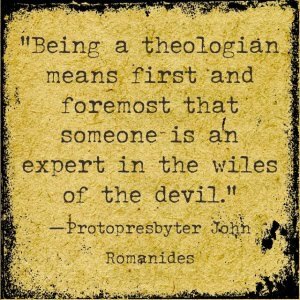 Orthodox or a Protestant?" I said to him. "Where did you find that in writing?" "Why?" he retorted. "Can't Christ hear me?" What a remark! - Elder, does physical ascesis help in the struggle against one's passions? - If it is implemented for that purpose, it helps. The body is humbled, and the flesh becomes subservient to the spirit. But "dry" ascesis(1) will give rise to illusions, because it cultivates passions of the soul, it bloats one's pride, it increases one's self-confidence and will lead to delusion. Thus, one is able to reach various conclusions about their spiritual progress, by the "dry ascesis" that was implemented. "I achieved this and that, whereas so-and-so has fallen short; I reached the heights of Saint so-and-so, and have even surpassed the other Saint..." - and all this, accompanied by fasts and night-vigils. But it is all futile, because it was not pursued for the purpose of excising one's passions, but only for satisfying oneself egotistically. I had met a monk who lived ascetically out of pride, and whose conscience told him that he was a great ascetic. He had become a total wreck; he didn't eat, he didn't even wash - he was wallowing in filth. His clothes had frayed on account of the grime on them. I tried to wash them, but what could you possibly wash? They had rotted. One time he even said to me: "I have surpassed Saint John the Kalyvite." "What are you talking about? Did Saint John become a saint through grime?" I exclaimed. A few days later when he visited me again, he said, "I have also surpassed Saint Maximos the Hut-burner." "What do you mean, you surpassed him?" I asked. "Well, I have made the rounds of the entire Holy Mountain like a whirlwind!" "You poor fool," I replied; "Saint Maximus had become de-materialized and could fly; he didn't rush around like you." After some time, he began to implement the "remembrance of death" and would think to himself, "Now I am in Hell." Even later, supposedly humbling himself, he began to say "Now I am a devil... Satan... and I will be going to gather followers...", after which, he ended up deluded. - Elder, you have said that during the hour of prayer we should avoid bringing to mind various images from the life of Christ etc. Why? - So that the devil won't seduce us with imaginings. Imagination is a good thing, it is a powerful thing, provided it is utilized properly. For example, certain people can see a landscape right now, and after one year, remember it exactly as they had seen it and draw it. That is a talent that God gives to man, but one also that the devil will exploit. Those who are deluded will imagine whatever they see or read in the manner that they want, and then, they believe that those imaginings are reality. To help such cases, there must be constant supervision of the poor souls, because the devil deceives them continuously. Which is why - if a person has imagination by nature - there should be some concern when they tell him that he isn't thinking properly and that he should place question marks on his thoughts. I had met a simple woman, who prayed continuously and beseeched Christ to allow her to see Him in this lifetime, since (she claimed) she would not see Him in the other life. Christ indeed appeared to her during the moment of Holy Communion, inside the Holy Chalice, in the form of an infant, with bloodied hair, and then He disappeared so she was able to receive Communion. But, after this incident, the enemy began to besiege her with the thought that she was something special. From that moment on, the devil worked on her imagination and kept presenting movie scenes to her. When I went out to the world at one time, I had found her in a house and had heard all the fantasies that she was telling the men and women who had gathered there. It was all I could do, trying to set her straight. The only solution was to give her an earful in front of everyone, so that her delusions would be exposed and she be humbled. - They were her imaginings only? - Elder, didn't she tell her spiritual father all those things? - You know what happens? Satan fools them with the things they "see"; they show no concern whatsoever, so it doesn't occur to them that they should speak to their spiritual father. What an artist the devil is! Horrible! If one isn't careful with their imagination, temptation can exploit even the simplest, natural phenomenon and mislead them. At the Stomiou Monastery, while reading Vespers during winter, I would light the wood stove. The women who occasionally came up to the monastery had noticed that the icon of the Panagia on the iconostasis used to creak during Vespers (something that I hadn't noticed) and the one would say to the other, "Whenever the monk reads Vespers, the Panagia's icon goes 'crack-crack-crack'." When I learnt of this, I said: "Let's take a look at the icon that goes 'crack-crack-crack'." It's not that I don't believe in divine phenomena; I believe that the Panagia will appear and will speak and be visible to those who are in a spiritual state, but caution is advised. So I got up on a chair to take a closer look at the icon. What was happening? Well, the icon was an old one, and it had an embedded cross-beam. (2) When the wood stove was lit, the beam would heat up and begin to creak as it expanded. I nailed it down and the creaking sounds stopped. I then asked the women: "Can you hear anything now?" "No", they replied. "Well then, don't pay attention to such things." Things like these need caution, because if imagination is gradually cultivated, man's entire life goes to waste. - Elder, how does one understand if an event is actually from God or if it's from the devil? - You can tell. If it's not from God, the devil will instill thoughts of arrogance. What's more, whatever the devil does is clumsy: he goes to extremes. Once there came a deluded and demon-possessed man to my Hut. I told him several things and helped him out. Do you know what he said? "This is the first time I've heard such things! I haven't read anything like that, even in the Gospel!" In other words, it was as though he was saying: "You spoke even better than Christ". Do you understand what the devil does, in order to bring on an arrogant thought? Finally, if a person doesn't realize that he alone can do nothing, but that everything he does, he does with the power of Christ, then even if he can drive out a thousand demons from a demon-possessed person, he still won't be helped. Whoever has not felt that superior joy, the heavenly kind - that is, if he doesn't have any spiritual experiences - then he can easily be deluded if he isn't careful. The devil is cunning. He arouses a person's heart a little and makes him feel pleasure, and thus deludes him by giving him the impression that that pleasure is spiritual, or divine. He steals the heart and man thinks he is doing fine. "I didn't feel at all disturbed" he will say. Yes, perhaps, but what you felt was not the true, the spiritual joy. Spiritual joy is a heavenly thing. The devil can appear either as an angel or as a saint. The demon camouflaged as an angel or a saint will propagate disturbance (which is what he possesses), whereas a true Angel or Saint will always propagate a paradisiacal joy and a heavenly exuberance. The humble and clean person - even if inexperienced - can discern between an Angel that is from God and a demon that appears as an angel of light, because he is spiritually "clean" and more closely related to the Angel. The egotist and carnal person will however be deluded easily by the cunning devil. When the devil appears as an angel of light and the person forms a humble thought, the devil will vanish. One evening at the Stomiou Monastery after Vespers, I was saying the Prayer in my cell, seated on a stool. For a moment there, I heard the sounds of musical instruments coming from a building nearby which was built for visitors. I was puzzled! "What musical instruments are they, that can be heard so close by?" I wondered. The feast-day's celebration was over. So I got up from my stool and went to the window to see what was going on outside. Stillness everywhere. That's when it occurred to me that it was an act by temptation, to interrupt my prayer. So I turned around and continued my praying. Suddenly, a blinding light flooded my cell. The ceiling vanished, the roof split open and a column of light appeared, which reached the sky. At the top of this luminous column I could see the face of a blonde-haired young man with long hair and a beard, who looked like Christ. Given that I could see only half of his face, I got up from the stool so I could see it fully. Then I heard a voice inside me saying "You have become worthy of seeing Christ". "And who am I, the unworthy one, who has become worthy of seeing Christ?" I said to myself, and I immediately made the sign of the Cross. The blinding light and the imaginary Christ vanished in an instant, and I could see that the ceiling was still in place. If a person doesn't have his head screwed on tightly, the wicked one can plant thoughts of arrogance and lure him with fantasies and false lights - which wouldn't lift him up to heaven, but rather dash him down into chaos. That's why one shouldn't ask for lights or divine charismas etc., but for repentance. Repentance will bring humility and then the Good Lord will provide whatever that person needs. When I was at Sinai, at Saint Episteme's ascetic cell, the cunning little imp offered to... assist me! The cell had 3-4 steps. At night, when there was enough starlight, I would go to the caves and, in order to descend those steps, I would use a flint lighter. One time, when I tried striking it to light up, it wouldn't work. In an instant, I saw a bright light coming from a nearby rock, beaming down like a strong searchlight - pow! And how it lit up everything around! "Hmm.... I can do without this kind of lighting" I said, and turned back. The light vanished instantly. Oh that cunning devil - he didn't want me to light my way with my lighter so I could go down those steps! He was saying: "Isn't it a shame, putting himself to so much trouble? Let me give him light!" How thoughtful of the devil! - Elder, how did you understand that the lights weren't from God? - Oh, it's very evident. Awesome! - Elder, I am being plagued by some really ugly dreams. - When you see a bad dream, never examine what you have seen, how you saw it, or whether you are guilt-ridden, or at fault. The wily one, if he couldn't harm you by day, will come by night. Sometimes, God will allow it to approach us in our sleep. in order for us to realize that the "old man" inside us has not yet died. At other times, the enemy approaches a person in his sleep and presents various dreams to him in order to get him worried when he wakes up. That's why you shouldn't pay any attention whatsoever to dreams; just make the sign of the Cross, cross yourself and your pillow, and you can also place a Cross and one or two icons on your pillow and say your prayer until you fall asleep. The more you pay attention to dreams, the more the enemy will come and bother you. This is not something that happens to adults only; it can also happen to children. With young children - even they are little angels - the enemy goes and scares them when they are asleep, and they are jerked out of their sleep in agony, and they run, terrified and in tears, into their mother's arms. They can also be approached by Angels, so you can see them laughing joyfully in their sleep, or they awake out of an immense joy. Subsequently, the dreams that are brought on by temptation are an external influence of the enemy on man, while he is asleep. - And what about when you feel something is weighing you down in your sleep, Elder? - Sometimes, it can be attributed to an agonizing situation that one has experienced by day, or to various fears, various suspicions etc. Of course all these can be utilized by the little imp - it can make combinations in order to confuse the person. Quite often, sleep can be so light, that one might believe they're awake and praying in order for that weight to be lifted - which can even cause them to hold their breath. In fact, the devil can even take on the form of a person or a Saint an present himself in a person's dream. Once, the devil appeared to a patient in his sleep, in the form of Saint Arsenios, saying to him: "I am Saint Arsenios. I came to tell you that you will die. Do you hear? You will die." The man was scared out of his wits. A Saint never speaks to a sick person in such a manner! Even if the sick person is to die and a Saint appears in order to inform him of his death, he will inform him in a gentler manner: "God has seen your suffering, and that is why He will take you away from this world. You should prepare yourself." A Saint would never say "Do you hear? You will die!" - And what about when someone is shouting in his sleep, Elder? - It's better if he does; because then he will wake up. Many dreams have to do with one's agony. When a person agonizes or is very tired, those things struggle inside him and he sees them in dreams. Even I, quite often, when I encounter various problems during my meetings with people (injustices, etc, that have taken place), I will then see myself arguing with the other person in my sleep: "You fool!" I would shout, "you are insensitive!" and with all that shouting I wake myself up. - Elder, can one foresee something that will happen to him - from his dreams? - No. Do not pay attention to your dreams. Regardless if they are pleasant or unpleasant, one should not believe them, because there is the danger of being deluded. Ninety-five percent of dreams are deceptive. That's why the Holy Fathers say that we shouldn't pay attention to them. Very few dreams are from God; but even then, for someone to interpret them they must be pure of heart and have other prerequisites - like Joseph(3) and Daniel, who had God-given charismas. "I will tell you" Daniel said to Nebuchadnezzar "both the dream that you saw, as well as what it signifies."(4). But note what state he had attained! He was among lions and even though they were hungry, they didn't touch him(5). Habakkuk took food to him, and he remarked: "Did God remember me? "(6) If God didn't have the Prophet Daniel in mind, who else would He keep in mind? - Elder, some people don't have dreams. - Elder, when people narrate their visions to us or tell us that they saw a Saint etc., what should we say to them? - It is better if you tell them to be cautious. That is the surest thing, because not everyone can discern if a vision is from God or from the devil. But, even if a vision is from God, one must not accept it straight away. In fact, God is moved -so to speak- when He sees His creature not accepting it, because that shows the person has humility. If it was truly a Saint that appeared, God knows other ways of informing that soul accordingly, and leading it to where He wants. Care must be taken, because the little imp can come along, press the button and "turn on the TV entertainment". There was this soul, which hadn't been helped by people and as such, was entitled to assistance (divine assistance). God presented something to her, to help her. But afterwards, the devil planted thoughts in her: "For God to have made you worthy of seeing that vision, it looks like He is has something loftier in store for you." From the moment she believed a remark like that, the devil began to do his job and rendered her under his command! But God eventually showed pity on her once again. She saw a vision and heard a voice saying to her: "Write to Father Paisios all the visions you have seen." So she wrote me a letter with all the visions she had seen. The cunning one had wreaked havoc in her. They were actual visions, but she mentioned that only the first and the last were from God. The last vision was permitted by God, so that she might be helped to straighten out, and be rid of the delusion. Finally, the poor woman heeded my advice and got out of that mess. - Elder, how can one tell if someone is deluded? - You can tell, even by his appearance. The deluded person has a fake and outwardly emotionless appearance. He seems humble and meek, but deep inside, he harbors the big idea that he has of himself. If you look into his eyes, you will see that he regards other poor souls as ants. But you can also tell what he is, by the things he says. There was this deluded person, who was regarded by many people as a saint. He would tell them that Christ had appeared before him astride a horse, holding a flask of wine; that Christ offered him a drink from that flask, and that from that very moment, he received the charisma of foresight. One time, when he was talking to people, someone asked him: "Why can't I perform miracles also?" "Because you committed this sin, and that sin...." he replied. The poor man panicked, and he came to tell me about it. "Oh, come on," I said to him, "since when do Saints resort to such theatrics? Only the devil does. Couldn't you tell that it was the devil speaking? And even if what the deluded one said was true, again, it was the devil who was disclosing it." A woman once told me that they had taken a demon-possessed woman to someone who was rumored as being able to drive out demons, etc. He took them to a ruined chapel in the countryside. As soon as they entered the chapel, he took a stole and put it on. The woman was taken aback! A lay person, putting on a priest's stole? "Are you a priest?" she asked him. "What priests are you talking about?" he exclaimed, and began to slander priests in general. That's how those poor people realized he was deluded, and they got up and left immediately. - Elder, is a deluded person also insane? - And what about a deluded person, Elder, isn’t he also demon-possessed in some way? - Well of course he is! What else could he be? In fact a deluded person may well have more demons than a possessed person. But still, delusion is one thing and madness is another. There are two or three spiritual fathers who are partly pious, partly damaged, and who cause confusion to people: they “diagnose” everyone as demon-possessed and they won’t listen to anyone’s opinion. “I’m a priest” they claim; “I have authority!” If you happen to hear of such cases, you should make others cautious because such priests do harm to the Church, so you should say to them: “Go and find a proper spiritual father, if you want to get help.” They even reach the point of using my name – even a photo of me – to give people the impression that they communicate with me. Cases like these have “extenuating circumstances”, because they are merely naïve deep down. However there are other, malignant cases who will present vinegar as wine. One such case was a man who used to be an accountant working somewhere, but now he goes around northern Greece and presents himself as being my spiritual underling. He claims that I had given him the gift of insight and four or five other charismas, and he now deceives people and amasses money. - Is he a clergyman? - No, he is a lay person. He saw me one time at Daphne (of the Holy Mountain) and hid himself so that I wouldn’t spot him, because he is such a genuine underling of mine! Fortunately, he drinks and he smells of ouzo, so people notice that he is tipsy and they are quite cautious when around him. So many such frauds exist, who exploit people’s pain and make a profit from it! There was one such case who told a widow “your late husband’s one arm has not yet deteriorated, because his soul is in need of prayer.” “What am I to do now?” thought the poor distraught woman. “I might as well give him money, to pray for my husband’s soul.” After extracting a large amount of money from her, he later said: “Well, we have avoided the first danger. He is somewhat better now.” So, by giving-giving-giving him money, he ended up with half of her fortune, just so that her husband would find repose! There are also certain deluded ones who sign sick people with the sign of the Cross and mumble something under their breath, supposedly to make them better. People are fooled and they won’t go to confession, or bring a priest over to perform a Holy Unction or read a blessing over them, but instead go to individuals like that. And in the meantime they also give up a whole lot of money. I was told that in a village there were two such deluded individuals, who were ideal collaborators! The devil would bring on –say- a severe headache, or would generate a bout of sciatica to someone, and he would go to one of the two deluded characters and say: “Son-and-so has a powerful headache for such-and-such a reason.” With that opportunity, the deluded one would say to his compatriot: “I know the reason for the headache” and would reveal the cause immediately. “Wow! What a revelation!” the villager would exclaim; “so, what should I do now, for the headache to go away?” “You should go to so-and-so” he would say, and direct him to the other deluded character in the village. See what the devil concocted, to preserve people in their delusion? He made two deluded people collaborators – one who made the diagnosis and the other supposedly was the healer – thus keeping people away from the Church. - Elder, why do people often resort to deluded people for their problems? - Because the devil’s charismas are cheap and easy to obtain. The things that people ask of them are not difficult, and their passions are also satisfied. Instead of repenting for their sins – which they commit as human beings – and going to a spiritual father to confess, they go and find deluded ones – that is, the devil – and essentially ask him to solve their problem. Then they end up being tormented and don’t realize that the devil has bound them and controls them. - And how do they come to believe them? - People are confused. There are so many who claim to lead people to the correct path, when they themselves are in fact carrying a sack over their shoulder, with the devil hidden inside it! The Good Lord however does not allow him to be hidden completely. Sometimes the devil shows a horn or his tail, people notice, and they cry out in fear “What is that? A horn? A tail?” “No! What are you saying? It’s just the... stem of an eggplant!” they will say, in an attempt to fool them and present diabolical things as good and beneficial. Someone had come here once, together with companions. He was deluded. He had around thirteen others with him and he pretended he was an Elder. So I asked them: “Do you all belong to an organization?” They didn’t reply. “A club?” They wouldn’t reply. “Do you have any spiritual father?” No reply. They began to prostrate themselves before me. 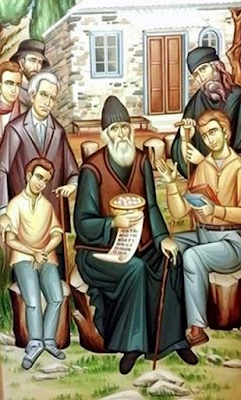 You see, he had brought them there on purpose, so that he could later say “we also went to Father Paisios, and he agreed with us”! Understand? I shouldn’t have witnessed that scene, because they exploited it afterwards. That guy looked suspicious. His followers appeared misled; the poor souls actually fell down on their knees! - Did you say anything to them, Elder? - I did, but as they departed, the cunning one told them otherwise; he drags people back and forth and brings them back onto his path again. - How can one protect himself from deluded people, Elder? - By remaining inside the shelter of our Church. Of course, if one were to follow a deluded person out of ignorance, God will not abandon him. He will help him see the error of his ways and bring him back to the truth. - Elder, what will help someone who has deluded notions to recover his senses? - He must become aware of his wretched state; he must not give any credibility at all to his own thoughts, and must reveal all his musings to his spiritual father and do obedience to whatever he advises. He should constantly ask God for His mercy, so that Divine Grace may come again. In other words, he needs to humble himself in order to recover and be saved. You see, the judgments, the wills of God are an abyss. His love has no boundaries! There was one person who used to come to the Hut frequently, and always had deluded notions. So many things I’d tell him, but to no avail. He would take everything the wrong way. Whenever he left the Holy Mountain, he would go around giving sermons and he caused a lot of harm. He would say he received instructions from me, and confused people. Even some books that I had given him as a blessing - he presented those so that people would believe that he sought my counsel. One day, as he was saying various things, Divine Grace abandoned him completely, and he began to grievously insult Christ and the Panagia, upon which, the people became suspicious and scattered. They afterwards took him away with a van and locked him up in a psychiatric facility. That’s how far God’s love will go: He will allow His name to be blasphemed, provided His creatures are helped and rescued! - Elder, if a deluded person acknowledges his delusion and repents, will his followers also repent? - If he has repented sincerely, he must humble himself and tell them that he erred, and then bring them back on the correct path. But if the deceits of a deluded person are revealed and he himself remains in his delusion, then his followers need to be properly alerted. Given that some deluded people may even act inside the Church, there is the risk that if their followers suddenly discover that everything they said was delusions they will be scandalized and uproot themselves from the Church. 1. The Elder characterizes as “dry” any ascesis that is an end in itself and not used as a means to cleanse his heart and attain perfection in Christ. 2. A small, lengthwise board which is inserted in a groove at the rear of a larger piece of wood so that it doesn’t warp. 6. See Daniel – Bel and the Dragon, 34-38. 8. At the monastery where he was tonsured a monk. 9. An edifice which includes 2-3 cells and a tiny chapel and belongs to one of the Monasteries of the Holy Mountain. 10. The building at Karyes, the “capital” of Athos, where the “Holy Community” (the administrative instrument of the Holy Mountain) is based, consisting of 20 members-representatives of the 20 Monasteries who are elected each year. From the book Spiritual Counsels of Elder Paisios of Mount Athos, vol. 3, ch. 3.